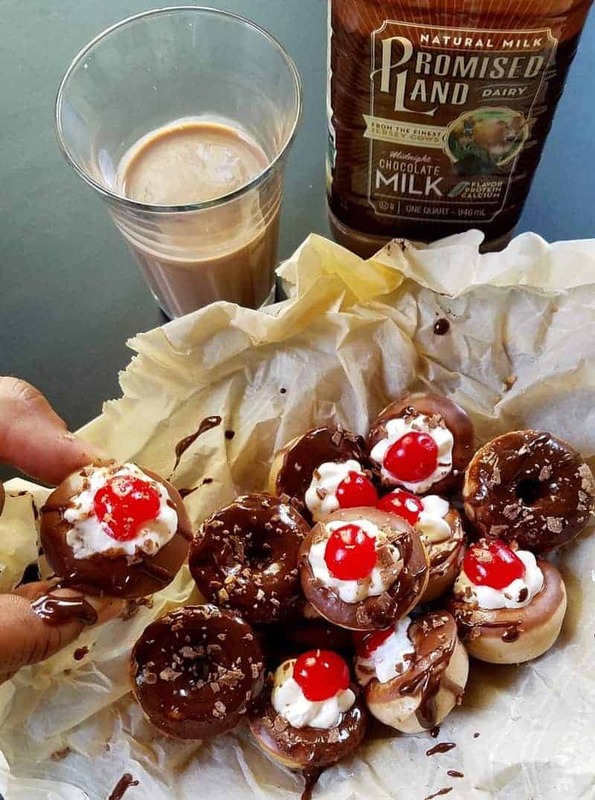 Mini Black Forest Pancake Donuts that are baked, quick and easy to make, and super delicious. They make the perfect after-school snack and cure for night time cravings. Disclosure: This is a compensated campaign in collaboration with Promised Land Dairy and #WeAllGrow Latina. Thank you for supporting the brands that I work with and love. … They are baked, easy and quick to make, eye-popping, and bite-sized, yet packed with plenty of flavor. They make you happy just looking at them, wouldn’t you agree? This means that the milk they produce is far from ordinary. It’s richer, creamier, and naturally higher in protein and calcium than ordinary milk. In addition, Promise Land Milk doesn’t add hormones, and is tested for antibiotics. It makes drinking milk a pleasure! 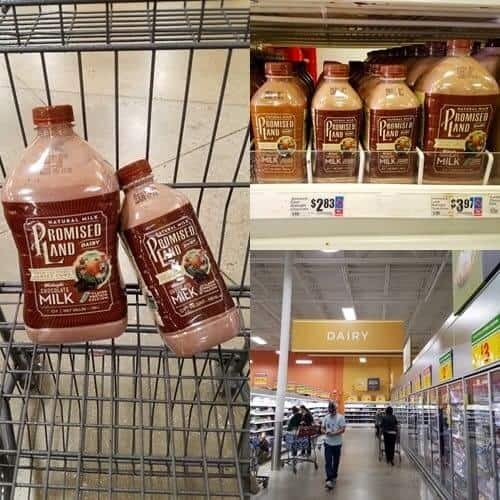 You can purchase it at H-E-B supermarket in the dairy aisle! 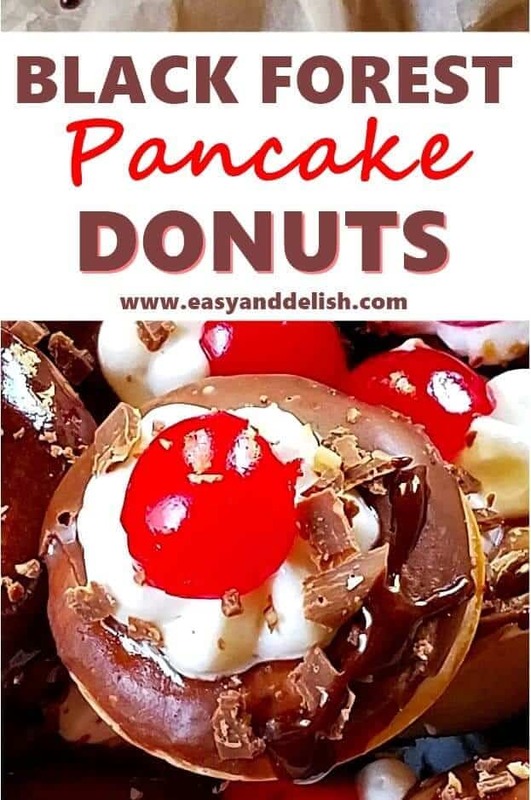 It pairs very well with our delish Black Forest Pancake Donuts, which were topped with whipped cream, maraschino cherries, and chocolate shavings. My kids (hubby and me too!) went crazy for them… so crazy that the entire batch was devoured after school, all while drinking Promise Land Midnight Chocolate milk. My hubby and kids were so excited that I didn’t have enough time to make a secret stash to enjoy later on at night. For more yummy recipes like this one, visit the Promise Land website. You can also follow them on Facebook, Pinterest, and Twitter for more info and updates. Well, for now, enjoy love at first bite! 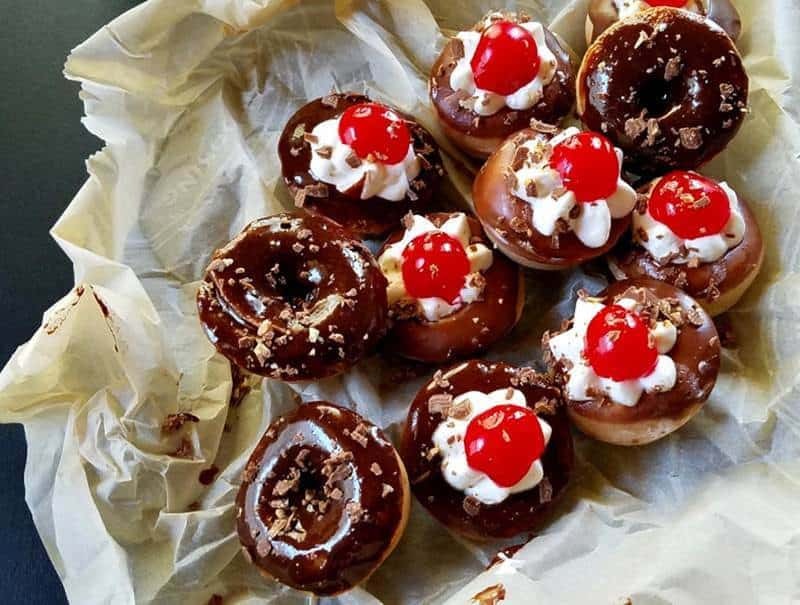 Mini Black Forest Pancake Donuts that are baked, quick and easy to make, and super delicious. They make the perfect after school snack and cure for night time cravings. Preheat oven to 350 degrees F (180 degrees C). Grease mini donut pan with butter and set aside. In a large bowl, combine the pancake mix with 1/3 cup of Promised Land Midnight Chocolate Milk, 1 Tablespoon cocoa powder, 3 Tablespoons powdered sugar, the egg, and 1 Tablespoon melted butter. Whisk just until batter is homogeneous, without lumps. Either pipe or carefully spoon donut mixture into the greased mini donut pan to 1/2 full. Bake for about 8-10 minutes. Meanwhile, prepare the icing by whisking together 2 Tablespoons Chocolate Milk, 2 teaspoons of cocoa powder, and 1/2 cup powdered sugar in a medium bowl. Make sure mixture is homogeneous and smooth (not lumpy). Set aside. Once donuts have baked, remove pan from the oven. Let donuts cool to warm temp and remove them from the pan. Dip the tops of the donuts into the icing and let set. Right before serving, pipe whipped cream on top and garnish with a halved cherry and chocolate shavings, if desired. Enjoy! This is a sponsored conversation written by me on behalf of Borden Promised Land and WeAllGrow Latina Network. The opinions and text are all mine. My mom loved Black Forest Cake! These scrumptious little donuts remind me of her, bravo Denise! I wouldn’t have thought to use pancake mix for donuts…I bet they disappear almost instantly. I like a good slice of Black Forest Cake, a classic in Germany, but I have never had it in donut form. Sounds and looks delicious! Neat idea! I love Black Forest anything, but I think you’ve taken the flavor to another level. Thanks! 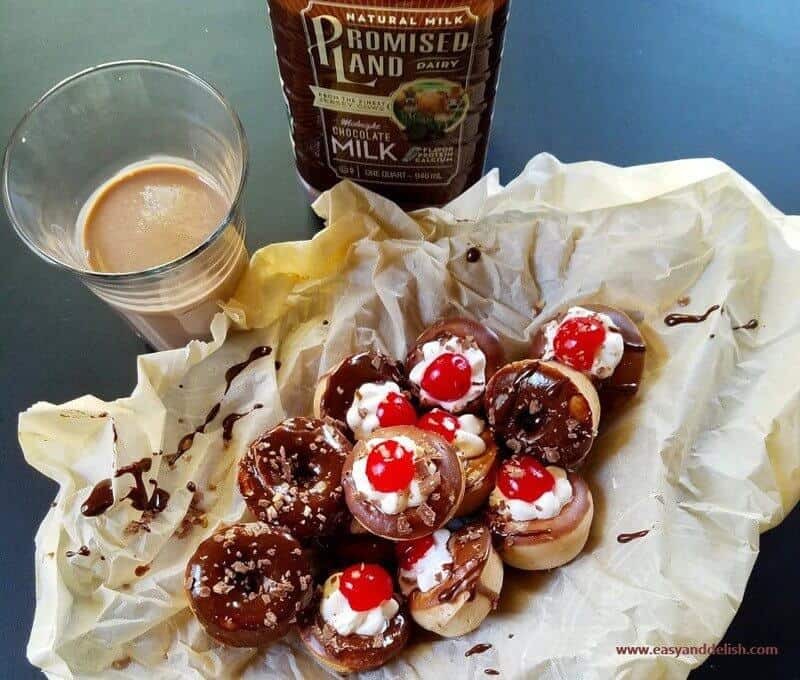 This is so interesting Denise, using pancake mix to make donuts, and I am loving the idea of adding chocolate milk to the batter…looks great! 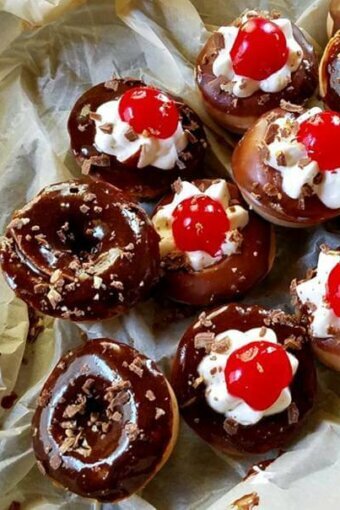 These little donuts look amazing, I can see why you would want to have a secret stash, black forest cake is my favorite. Sending you lots and lots of hugs! Thank you so much! You guys are in the list of my fave blogger friends. I found myself willing to share what I have learned about American cuisine as well in these 15 years living in the USA… and also because I do have a multicultural family. I hope people enjoy it! Shut the front door…. what an outstanding donut flavour. I am going to make these little beauties and bring to work to share with my colleagues for morning tea. So much yum!